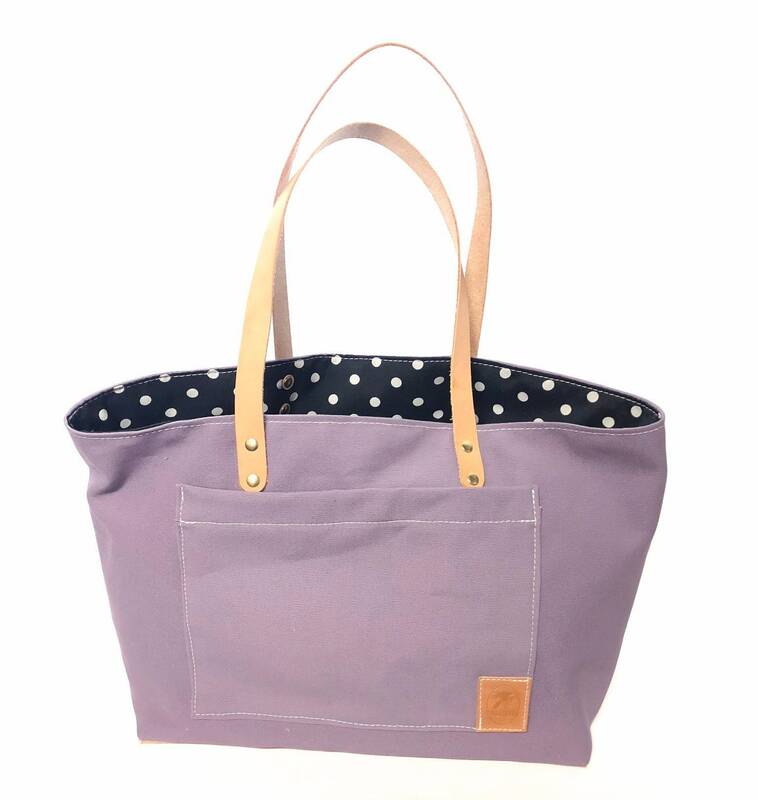 This simple and versatile tote is made from high-quality canvas duck and features beautiful natural leather straps which are fastened securely with brass rivets. It is the perfect size for daily errands and light travel. Big enough to hold everything, small enough to find everything that is in it! There is a smaller pocket on the exterior for keys and other quickly accessible items. 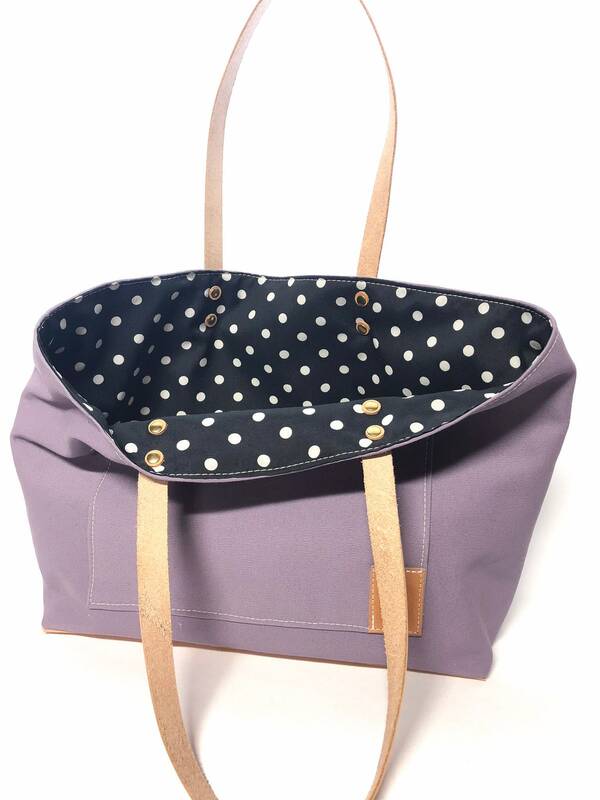 This bag is purple canvas and lined with vintage polka dot fabric. A protective leather base is stitched sturdily onto the bottom of each bag. A fabric wax such as Otter Wax can be applied to this cotton canvas tote if extra protection is desired. I accept PayPal, credit cards, Etsy direct checkout, and Etsy gift cards. If you do not have a PayPal account you can still use PayPal with your credit card. If I don't receive payment within three days, I will cancel the order and re-list the item. PLEASE NOTE: International customers are responsible for all fees, taxes & duties associated with shipping to their respective countries. Also, international shipments can take longer due the customs process. I do everything possible to pack all shipments very carefully. However, in the event that an item arrives to you in damaged condition, please provide me with photographs of the damaged item and packaging. This is required for insurance purposes. Once I receive these photographs I will file a claim with USPS and send you a refund as soon as I receive it from them. If for any reason you are not completely satisfied with your purchase please contact me and we can find a solution. In the event of manufacturer defect, I will pay for shipping and repair your item, for up to one year after purchase. I accept exchanges, but you must pay for shipping. I accept returns on a case-by-case basis. I cannot offer returns on custom items, but I am happy to discuss alteration or other options in the event that you are not satisfied with your custom piece. I am happy to sell wholesale, contact me for wholesale pricing and minimums.